BACKGROUND: In developing countries, the leading cause of childhood blindness is corneal scarring. Although the service of corneal transplantation depends on several factors, availability of potential donors is of paramount importance. Attitude of eligible donors is the main factor that affects corneal supply. However, limited data exist on eye donation. Hence, this study intended to assess the knowledge and attitude toward eye donation and its associated factors. SUBJECTS AND METHODS: A community-based, cross-sectional study was conducted on 760 adults aged ≥18 years selected using multistage systematic random sampling in Gondar town, Northwest Ethiopia. A face-to-face structured questionnaire interview in home-to-home visit was applied to collect the data. Descriptive and analytical tests were performed. A binary logistic regression was fitted. Those variables with P < 0.05 were considered statistically significant. RESULTS: This study comprised 760 adults with a median age of 30 years. The proportion of overall level of good knowledge and favorable attitude toward eye donation was 8.4% and 59.9%, respectively. It has been also recognized that attitude was positively associated with educational level of high school (adjusted odds ratio [AOR] = 2.41, 95% confidence interval [CI]: 1.41–4.14) and college/university (AOR = 2.73, 95% CI: 1.53–4.89) and awareness (AOR = 1.50, 95% CI: 1.05–2.03). CONCLUSIONS: Although the overall level of knowledge about eye donation was poor, the proportion of favorable attitude toward eye donation was fair. Since it was associated with educational level and awareness, it is strategic to follow multidisciplinary approaches to facilitate multi-stakeholder partnerships and to motivate the people to donate their eyes. This study consisted of 760 adults, which represents 90% response rate. The median age of the participants was 30 years. The majority of the study participants (86%) were Christians followed by Muslims (14%). Regarding completed education level, nearly 70% of the study participants completed high school and above [Table 1]. Among a total of 760 study participants, 429 (56.4%) of them had awareness about eye donation. The median knowledge score point for those who had awareness was 5.0 ± 1.6. The majority of study participants knew that a living person can pledge to donate eyes (88.3%), but it is not permissible to donate eyes while being a live (77.2%). Furthermore, more than two-third of the participants did not know the optimal time to retrieve the eye after the death of person and which part of the eye can be donated. Overall, the majority of the participants (59.4%) had average knowledge followed by poor level of knowledge (32.2%) about eye donation [Table 2]. Among 760 study participants, more than 85% of the respondents felt that eye donation is a pleasure act and noble work. Regarding disfigurement and religious concern, 67.1% and 66% of the participants supported that eye donation does not cause disfigurement and not against their religious doctrine, respectively. Overall, the majority the respondents (59.9%) had favorable attitude toward eye donation and median attitude score point of 16 points [Table 3]. On applying bivariate analysis, attitude toward eye donation was positively associated with middle age, marital status, higher educational level, greater monthly income, and having previous awareness. In a multivariable logistic regression, higher educational level and awareness were remained associated with attitude toward eye donation. Regarding educational level, those who completed high school and college/university were 2.41 (adjusted odds ratio [AOR] = 2.41, 95% confidence interval [CI]: 1.41–4.14) and 2.73 (AOR = 2.73, 95% CI: 1.53–4.89) times more likely to have good attitude toward eye donation than those who have no formal education, respectively. 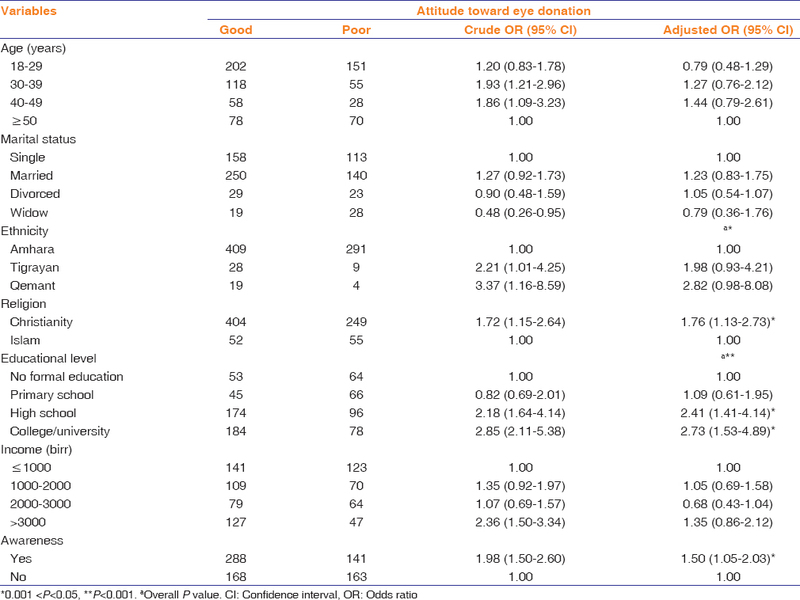 In addition, those who had awareness were 1.50 times more likely to have good attitude than participants not heard of eye donation before (AOR = 1.50, 95% CI: 1.05–2.03) [Table 4]. Gelaw Y, Ambaw F. Socio-demographic correlates of attitude towards corneal donation among health science students and academic staff of Jimma University. Ethiop Med J 2010;48:41-7. Berhane Y, Worku A, Bejiga A, Adamu L, Alemayehu W, Bedri A, et al. 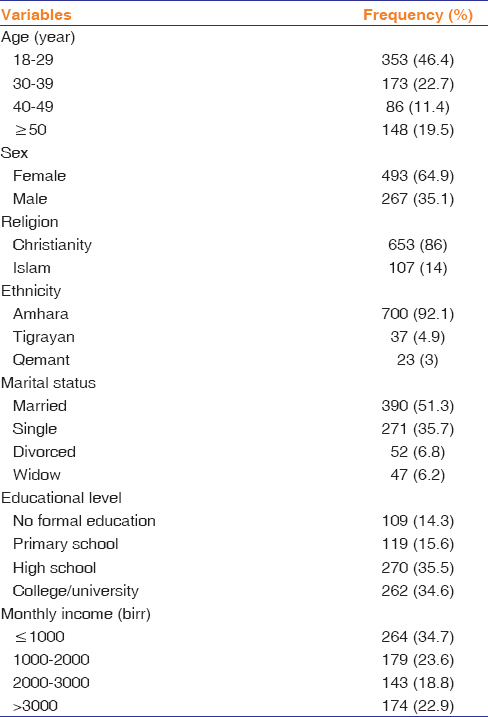 Prevalence and causes of blindness and low vision in Ethiopia. Ethiop J of Health Dev 2008;21:204-10. Yadav SK, Patil SB, Narasannavar AB, Angolkar M. Knowledge and attitude regarding eye donation among undergraduate nursing students of Belagavi city: A cross-sectional study. Int J Interdiscip Multidiscip Stud 2015;2:17-23. Rajan MS. Surgical strategies to improve visual outcomes in corneal transplantation. Eye (Lond) 2014;28:196-201. Rao GN, Gopinathan U. Eye banking: An introduction. Community Eye Health 2009;22:46-7. Healio. Eye Banks World Wide Increasing Standards Expanding Mission. Available from: http://www.healio.com. [Last accessed on 2016 Apr 17]. European Eye Bank of Associatrion. Eye Donation. Available from: http://www.eebaeu. [Last accessed on 2016 May 05]. Gaum L, Reynolds I, Jones MN, Clarkson AJ, Gillan HL, Kaye SB, et al. Tissue and corneal donation and transplantation in the UK. Br J Anaesth 2012;108 Suppl 1:i43-7. Irving MJ, Tong A, Jan S, Cass A, Rose J, Chadban S, et al. Factors that influence the decision to be an organ donor: A systematic review of the qualitative literature. Nephrol Dial Transplant 2012;27:2526-33. Gessesse G, Tilahun Y. Willingness to donate eyes and associated factors among adults in a rural community in Central Ethiopia. J Ophthalmol East Cent South Afr 2013;17:20-4. Bhandary S, Khanna R, Rao KA, Rao LG, Lingam KD, Binu V, et al. Eye donation – Awareness and willingness among attendants of patients at various clinics in Melaka, Malaysia. Indian J Ophthalmol 2011;59:41-5. Okoye OI, Maduka-Okafor FC, Eze BI. What does the medical student know about eye donation/corneal transplant? The University of Nigeria Scenario. West Indian Med J 2010;59:41-4. Yew YW, Saw SM, Pan JC, Shen HM, Lwin M, Yew MS, et al. Knowledge and beliefs on corneal donation in Singapore adults. Br J Ophthalmol 2005;89:835-40. Kumar S, Shukla US, Agarwal P. Awareness and knowledge on eye donation among students at Bhopal. Natl J Community Med 2012;3:685-9. Priyadarshini B, Srinivasan M, Padmavathi A, Selvam S, Saradha R, Nirmalan PK, et al. Awareness of eye donation in an adult population of Southern India. A pilot study. Indian J Ophthalmol 2003;51:101-4. Chu T, Wang LN, Yu H, Zhang RY. Awareness of cornea donation of registered tissue donors in Nanjing. Chin Med Sci J 2013;28:20-7. D'silva F. knowledge and attitude towards eye donation among adolescents of a nursing institute in Mangalore. Int J Adv Res 2015;3:727-31. Cárdenas V, Thornton JD, Wong KA, Spigner C, Allen MD. Effects of classroom education on knowledge and attitudes regarding organ donation in ethnically diverse urban high schools. Clin Transplant 2010;24:784-93.